I had been hearing about Ashwin Sanghi's "Chanakya's Chant" ever since its launch, got my hands on it, but couldn't manage to read it, because my Dad wanted to read it first. So, when I was selected to review Sanghi's latest book, "The Krishna Key", I was very excited. My interest was boosted when I was going through the Author's Note, wherein he has acknowledges the people behind this book. I knew someone in that list - Kunal Kundu, who has designed this cover that invokes curiosity in the minds of the reader, even before he has turned the first page. The opening page of the story begins in italics, and tells you briefly about the lineage of Pandavas and Kauravas of Mahabharata. You turn the page, and the font straightens, and the first sentence that you read does not seem related to what you had just read. You would actually turn back to see if you have turned two pages at a time by mistake, but find that's how it has been written. And that opening line is a sixer - you cannot look anywhere else. A new story, equally interesting, starts unfolding! This book is written in two parallel stories - one narrated by Lord Krishna himself, and the other that flows like a movie plot. Characters are defined, the mystery builds, the mythological connections are integrated smoothly and then the truth emerges. Krishna tells you the story of his life, while a tale of cold blooded murder in the name of religion and conspiracy, intelligent riddles and perseverence continues alongside. Its an excellent book with an eye towards each detail. I liked the end - it makes you stop and take a look at yourself. The writing style is gripping (rather clinging), making it an "unputdownable" creation - so much so that I devoured it in two days! Never have I completed a 460-odd page book so fast! A popular saying states that it's all pre-decided, and incidents that happen in our lives are pieces of a jigsaw puzzle - It seemed to come to life when I was wondering that I was lucky to have been an Architect - Town planner, with a passion for our history, ancient civilizations and more. It seemed to me that I was destined to read this book; and my piecemeal knowledge of mythology and history, experiences of places I have travelled to and read about would get drawn up from the depths of my memory, get jumbled up, and be sorted out in a pattern once again. The book will make you feel proud of India for its rich heritage. Immense research has gone in writing this book. It is not the work of Sanghi alone, but a team of talented people who have drawn such lovely sketches (Rupesh Talaskar) and drawn so much reference from Sanskrit (Vishwajeet Sapan) shlokas (verses). Another thing you are bound to notice is that Sanghi has extremely detailed knowledge of gadgets and mobile phone models - very casually, he uses statements such as "flipped his Samsung ZX03", highlighting the unique things you can do with it. 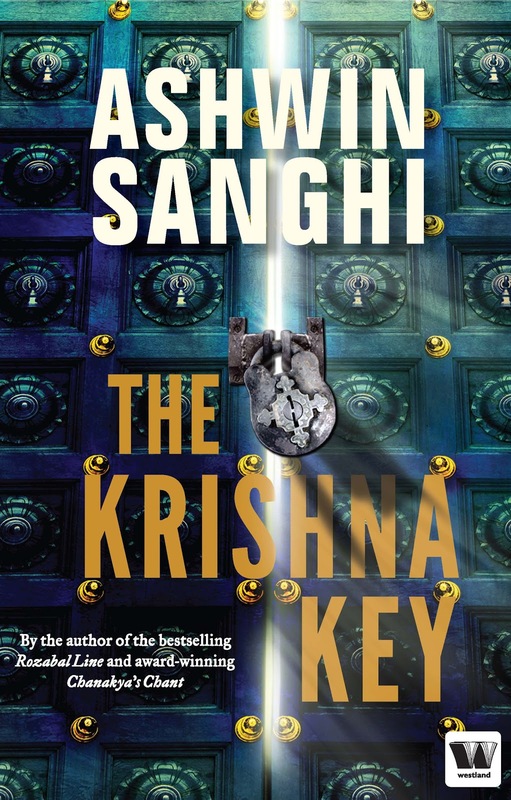 The chapter numbers are encircled in an image of a (locked) lock, signifying the mystery to be unlocked by the "Krishna Key". It would have been very interesting if the image for the last chapter had been an open lock or a key. I would give this book a 8 out of 10, half a mark deducted for the last round of proof reading it seems to have missed. Somewhere in between the names of the leading female characters have got interchanged; except which this book is a great work. You have summed up the book in brief & so very aptly,Anu. Not just the missing out of characters but even proper english usage was missed out on.! Even then the book was a treat.! Gotta know a lot about Mahabharata because of it.! and also it gives out a good message.! A good book at the end of the day! Yes, a bit Dan Brownish.. but no problem. Its a book worth having. Came here via a link on Twitter --wasn't disappointed. I read a review on the Chanakya book today, so am going to dig up books by this author. I hope they're available on Kindle. Vraiment étonnant et très intéressant. What's your twitter id? I hope you get hold of the books - Flipkart is a good option in India. Not sure about Kindle. I liked this book for the fact that the story was intertwined with facts. The historical info was well researched and believable! This is a new genre in Indian fiction and I wish more authors could take up fact-based/historical fiction writing like this. Peace is essential, isnt it? Thanks for dropping by and Welcome!! Great review. I am a huge lover of books so I will put this on my reading list. Come by and check out my blog if you like it I would love it if you followed me. Sound interesting. I would like to look at my life as a jigsaw puzzle. I'm going to be reading this one soon. Thanks Anupama. You should read this book to learn a lot about Hindu mythology. You should - it will enrich the way you look at life. It is indeed a "must read" book! Welcome to my blog. Ashwin Sanghi has overdone it this time. I read Chanakya Chant, liked the concept and got this book. But boy was I disappointed! Its a vain attempt to write an Indian Da Vinci code.The book can be summarized in one line. Every thing in the world is related to every other thing ( as per his convenience of course) and they all have their roots in India. Characters lines are flawed. Everybody goes the roundabout way perform simple tasks, thereby ending up only complicating the story. It seemed like twists had to be force fed to make it a "thrilling novel.